Submitted by Taps Coogan on the 29th of January 2019 to The Sounding Line. 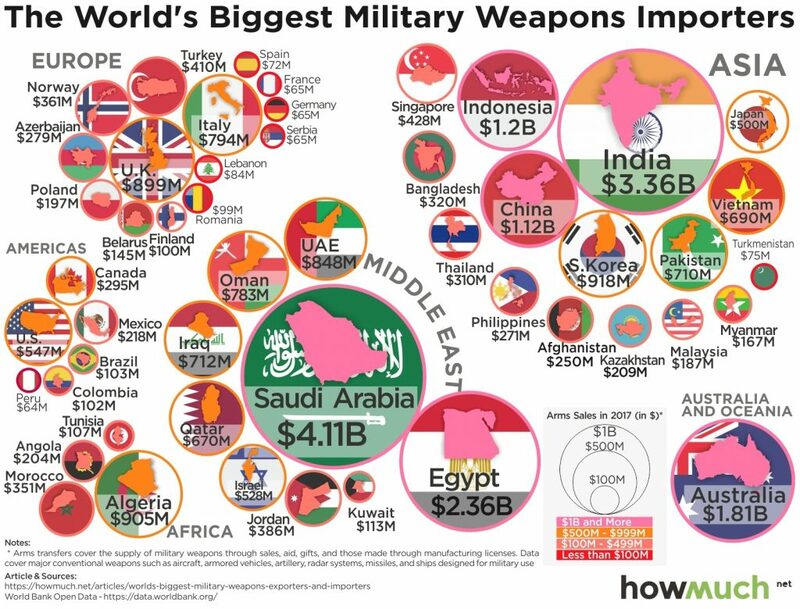 The following two infographics, from the cost estimation website HowMuch.net, visualize which countries are exporting and importing the most military weaponry around the world. 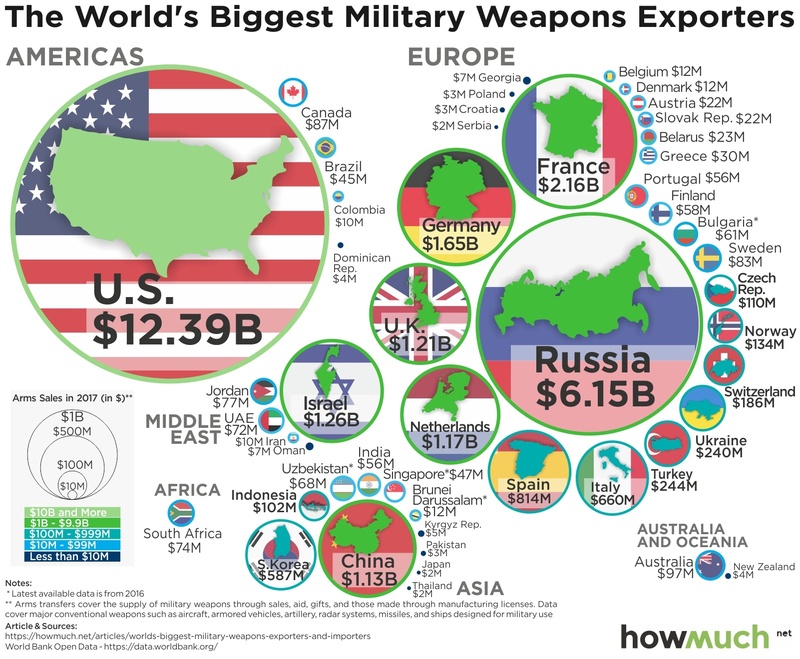 The United States ($12.39 billion) and Russia ($6.15 billion) remain by far the largest arms exporters in the world, with the US exporting over twice the value of weaponry as Russia. The US and Russia are followed by France ($2.16 billion), Germany ($1.65 billion), and the UK ($1.21 billion). China, a rising military power, the most populous country, and the second largest economy in the world, is only the seventh largest arms exporter, ranking behind Israel and the Netherlands. South Africa is the only country in Africa to make the list and no countries from Latin America appear. Saudi Arabia remains the world’s largest weapons importer ($4.11 billion), followed by India ($3.36 billion), and Egypt ($2.36 billion). Saudi Arabia imports most of its equipment from the US, while India has traditionally been a major buyer of Russian arms. Sub-Saharan Africa and Latin America are similarly absent from the list. Rick Santelli: Tapering the Taper → ← Taps Coogan: When Will the Actual Brexit Negotiations Begin? Wow, these two maps are essentially maps that help one easily visualize the deeply psychologically disturbed fear mongering, insane populations that the U.S. has inculcated over many decades with its abject propaganda of “we spread democracy” all over the world, which really means we brutally murder innocent people to install dictators after we’ve over thrown democratically elected leadership so that we can exploit natural resources, and sell arms for great profits that go to a small segment of kooks in our population.